A text link Mom is a smart business woman that realizes the value of networking and linking with other sites. She knows that by participating in the Text Link Mom's program as a member of The Mom Pack, she'll meet many wonderful, smart business Moms like herself and gain a wealth of knowledge, support and friendships. This is not intended to raise your link popularity, although it will. We call it a neighborhood community working together to build our businesses bigger and better and it's been proven for over 5 years that this really works! What does a Text Link Mom do? 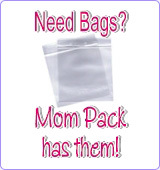 A Text Link Mom submits her info to the Mom Pack Text Link Program and creates a separate page on her website to display the official Mom Pack Text Link listings. She does updates to this page at least once every three months (though updates are made available on this site more often than that). How do I become a Text Link Mom? First, you have to understand how the program works and be willing to MAKE THE COMMITMENT TO ACTIVELY PARTICIPATE! It's not hard, but it does require you to create the initial page (we provide the html) and do updates. Currently, we require you to update your page at least once every 3 months. After you thoroughly understand what will be expected of you and you've agreed to carry through on "your end of the deal", simply fill out a simple Text Link Mom submission form and you're on your way! By submitting your site to become part of Text Link Moms, you will be expected to add a page to your web site that contains the master html for the text link page (you'll be given this file later). NOTE: We require the below setup because we verify links randomly. If we cannot find your link by either typing in the mompack.html, mompack.htm or mompack after your domain, then you will be removed. We'll think you are no longer participating. Don't chance that! You may want to add one of our mini buttons with a link to your mompack page off your main page of your site to protect yourself from possible deletion. Create a sub directory (folder) on your web site and name it mompack. This program is NOT the same as "trading banners" or "swapping links". You are certainly welcome to do that with anyone you choose but it does not have anything to do with the Text Link Moms Program. Even if you exchange links or banners with other Mom Pack members, you are still obligated to maintain this page on your site if you are participating. If you do not create and or maintain a Mom Pack Text Link page on your site as directed, your listing is subject to deletion. Please understand that to participate, you MUST create and maintain the official page ON YOUR SITE. If every participant does this, you will have lots of sites out there with your link! Can I see what a Text Link page looks like? Sure, click here to see a Mom Pack Text Link page in action! Okay, I'm ready. Sign me up and get further instructions! Special thanks goes to the Mom Pack Staff for keeping our links verified and updated!